Jerome Sinclair is set for a swift reunion with Sunderland. The former Black Cats has joined Oxford United on a loan deal until the end of the season. Sunderland travel to the Kassam Stadium to face Karl Robinson's side next Saturday. Sinclair made 19 appearances for Sunderland in the first half of the season, scoring two goals. 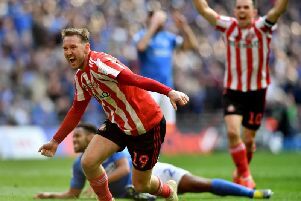 Sunderland, Watford and the player came to a decision to bring his loan to an early end at the beginning of the month as he fell down the pecking order. Jack Ross hailed his attitude during what was an occasionally difficult loan spell. "He’s such a lovely boy, really really good," Ross said. We just collectively felt, he needs to play games and he obviously knows that we’re trying to strengthen that area of the pitch again. "I think he’ll go back to Watford, take a breath and see what he wants to do next. "I can’t speak highly enough about his attitude, he’s been at it every single day even when he’s been out of the team," Ross added. "He’s not been one bit of bother." Oxford boss Karl Robinson says he is confident Sinclair can make a big difference. "I think he’s fallen below what was made of him," he said. Sinclair's departure was also hastened by the emergence of Benji Kimpioka, who is training with the first team squad more regularly after a string of impressive Checkatrade Trophy performances. Sunderland are yet to replace Sinclair or Josh Maja, and are eager to try and get two deals for strikers done before the 11pm deadline. They confirmed the signing of promising winger Lewis Morgan earlier on Thursday.